Late dawn. Early sunset. Short day. Long night. 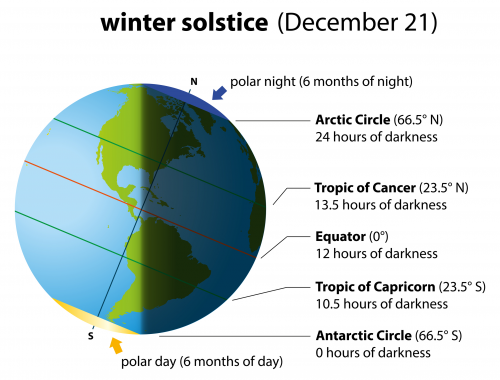 For us in the Northern Hemisphere, the winter solstice marks the longest night and shortest day of the year. The December Solstice can happen on December 20, 21, 22 or 23, though December 20 or 23 solstices are rare. The last December 23 solstice was in 1903 and will not happen again until 2303. If you are in the Northern Hemisphere, the increase rate of daylight hours depends on your location’s latitude – in more northern latitudes you will see a rapid increase in daylight hours compared to if you’re in the more southern latitudes. Many cultures around the world hold feasts and celebrate festivals and holidays to celebrate the December Solstice. Find out more by downloading this fantastic printable!